Galeries Lafayette Haussmann is more than just a department store. With more than 100 years of history, it became a worldwide symbol of the French Art de Vivre and the Parisian elegance. The gem of the Galeries Lafayette brand, the flagship store on Boulevard Haussmann is a department store that is continually in motion and that has always known how to stay up to date with the changing times to please its French and foreign shoppers. From affordable items to luxury goods, Galeries Lafayette Paris Haussmann is constantly expanding and upgrading their offerings to provide shoppers with all of the latest fashion trends. Sometimes avant-garde, always refined, the department store has a renewed selection of the foremost brands of the moment on offer. The flagship store on Boulevard Haussmann is home not only to the largest fashion collections in the world, but also to home interior design and gourmet food. Graced by a 33 meter-high neo-byzantine dome built in 1912, the store, recognized and acclaimed around the world, is Paris’ second most visited attraction after the Louvre. Located in the heart of Paris, Galeries Lafayette offer an amazing variety of products, from accessories, through cosmetics to gourmet. The store provides over 70 000 m2 of shopping space and more than 3 500 brands from around the world. While in Paris, don’t hesitate to discover our offer, going from VIP SERVICES, BEAUTY WORKSHOPS, CULTURAL DISCOVERIES, GASTRONOMY and much more. Discover our exclusive tailored services provided by experts in fashion and lifestyle. We will open the doors to our privileged services and areasin which we will exceed your expectations. Do not hesitate to book our multilingual personal shoppers and stylists. Gourmet Tour, Wine Tasting, High heels walking, Make-up sessions, etc. From 29 June to 22 August, Galeries Lafayette invites you to dive into the world of fashion and gastronomy through various workshops & fashion shows. RDV on web page. Through a heritage visit of Galeries Lafayette Paris Haussmann, visitors are invited to discover the history of the famous department store: the secrets of the building’s construction, the great hall, the dome, the terrace, etc. This Parisian institution has become a place where artistic currents have converged since the beginning of the 20th century. 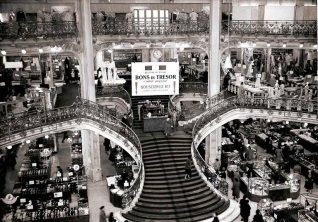 Discover over 100 years of history within the store, a temple of Fashion, during a one hour discovery tour. Galeries Lafayette Paris Haussmann offers visits in English and in French. Lafayette Gourmet now covers 3,600 m and features 14 outlets serving food, with something to satisfy every fancy. With some new concepts and the best-known food brands around, Lafayette Gourmet becomes a shrine to gastronomy and the pleasures of eating – whether for the everyday grocery shop or for a truly exceptional gourmet experience. As baskets fill with treats from Pierre Hermé pâtisserie, Maison Petrossian or Liberté bakery, customers are spoiled for choice by the outstanding range of top quality delicatessen fare, fresh produce, French specialities and international delicacies also on sale. Paris is the fashion capital of the world and Galeries Lafayette is fashion’s premier showcase. We have a broad range of services on offer for your clients as well as numerous activities for your groups. Let us take you on a unique journey in the Department Store Capital of Fashion through our customised offers. Because at Galeries Lafayette Paris Haussmann, the client is more than simply a visitor, he is our guest.